Home Features What Is a Psammophile? This kind of rock collector delights in the smallest specimens. 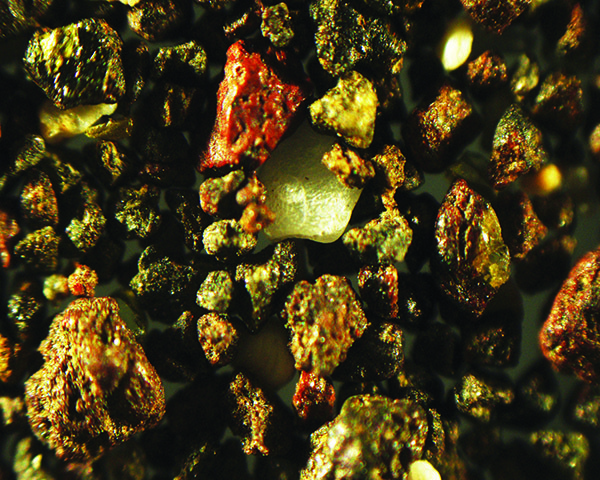 These angular igneous grains were found at a beach in Hawaii. Unfortunately, the friend who gave them to me did not record the name of the beach. 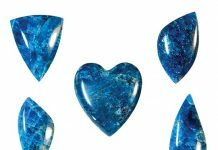 Since my early childhood, rock collecting has been an important hobby to me. As a native of St. Louis, I have spent many hours searching for fossils in the dolomite and limestone of eastern Missouri, as well as for Missouri Lace agate in the Ozark Mountains. However, there is another facet of rock collecting that is not well known: sand collecting! 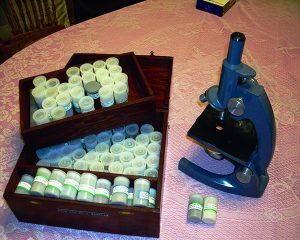 My sand samples are stored in old film canisters that are carefully labeled with the collection site. Hopen states that there are three main categories of sand: mineral sands, formed by the breakdown of rocks; biogenic sands, composed of the remnants of shells, corals, or other living organisms; and precipitated sands, formed from solutions. Beach sand from Nadi, in the Fiji Islands, contains well-rounded and highly polished quartz grains. Sand is available in infinite varieties in every county, state and country. Most often, sand is composed of quartz grains, with or without fragments of silt, pulverized shells and coral, or rock such as feldspar, obsidian, diorite, granite, glauconite, etc. Some sands are deposited by running water, while others are deposited by wind action. If the grains have been recently weathered from quartz crystals in granite or gneiss, they will be angular in shape; geologists call this type of sand “grus”, while in the construction business it is called “sharp sand”. These angular grains are the preferred type of sand for making concrete or for loosening clay soils in gardening. Other grains that have been transported long distances by water or wind will be rounded. Sand from some formations, such as the St. Peters Sandstone formation in eastern Missouri, contains a very high percentage of pure silica and has been used for many years for making glass. 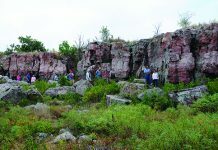 Crystal City, Missouri, got its name from the glass industry associated with the St. Peters formation. It is interesting to note that, in certain areas of St. Louis County and St. Charles County, this same formation lies underground. The Laclede Gas Co., of St. Louis, has drilled into the formation and pumped natural gas into it for storage. 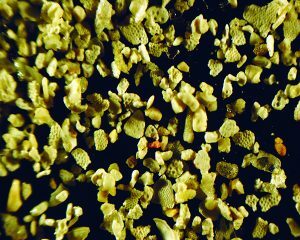 “Arenology” is the study of sand, and “arenophiles” (from the Latin word arenosus, meaning “sandy” or “gritty”) or “psammophiles” (from the Greek word psammos, meaning “sand”) are hobbyists and scientists who collect and study sand. Sand can be easily collected from streams, dunes, sand bars, spits and beaches. I like to use old film canisters for my collection, each labeled with the location where the sample was found. I have collected many samples myself, while others were given to me by friends. The samples are fascinating when viewed through a microscope. 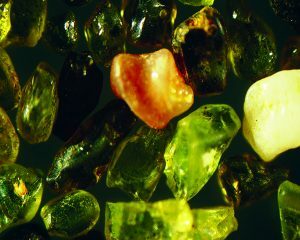 This sample from an unnamed beach in Hawaii contains rounded and angular olivine, quartz and igneous grains. I particularly like collecting sand from sand dunes. Dunes are fascinating. It is interesting to just close your eyes and listen to the tinkling sands as they are blown by the winds. Dunes are never stationary, but always moving. 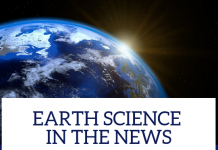 They are referred to as “aeolian” deposits, which means “wind blown”, and they can be found along shorelines, along stream courses in semiarid regions, where sandstones have deteriorated, and in areas of glacial outwash. They are found in the areas of the Great Lakes, marking both present and past shorelines. A stream in a semiarid region varies greatly in volume due to floods, and at dry times, great expanses of the streambed are exposed to wind action. Thus, dunes are found along the leeward sides of the Platte, Arkansas and Missouri rivers. The Sand Hills region of Nebraska covers almost 24,000 square miles. White Sands, New Mexico, is the world’s largest gypsum sand dune field, covering approximately 275 square miles. Dunes are longer on the windward side, where the sand is pushed up the dune, while the “slip face” on the leeward side is shorter. A “slack” is the trough between dunes. An area covered by extensive dunes is called a “dune field”, while a large dune field is called an “erg”. Dry inland regions contain the largest complexes of dunes, which are associated with former lake or sea beds. The shapes of dunes vary and can be described as crescentic, linear, star, dome, parabolic, longitudinal or reversing. 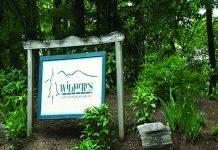 They provide homes for highly specialized plants and animals, some of which are endangered and/or rare. 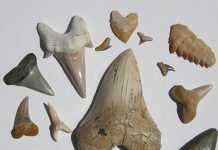 Beaches, too, are fun places to collect. Most people at the beach do their share of “beachcombing”, which mostly consists of collecting shells. Beaches are defined as coastal deposits of debris that lie above the low-tide limit in the shore zone. They are transitory features. Though beaches are sandy, they may also consist of cobbles, pebbles, shells, mud, or a combination of these. 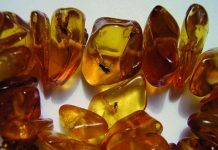 The Pacific Ocean beaches in Oregon and Washington are well known for the agates found on them. Beaches are composed of different parts. The “beach berm” is the area located mostly above water, depending upon the tide, and is actively influenced by the waves of the tides. A “crest” exists at the top of the berm, while the “face” is the area leading from the crest down to the water. A “trough” often exists at the bottom of the face, and seaward of this you may find “longshore bars”. Due to the waves caused by severe storms, there may be older crests, called the “storm beach”, farther inland. Farther back still, there may be dunes, if there is enough wind. This sample from Cabo Rojo Beach, Puerto Rico, consists of ground-up coral and shell fragments and is an example of a “biogenic sand”. Being a trout fisherman, I have always loved streams. I keep several old film canisters in my fishing vest for collecting sand while fishing. Whether they are small, intermittent creeks or large rivers like the Mississippi, the collecting can be great. A stream is defined as a flowing stretch of water confined within banks and a bed. The water for streams can come from springs, rain run-off, or melting snow and ice. At times of flood, the flood plain of a stream can expand greatly, and then be reduced significantly during dry times. A dry flood plain becomes a great location for wind-blown sands to accumulate and form dunes, as previously mentioned. 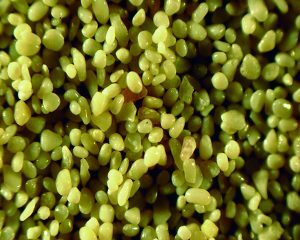 For viewing, I simply put a small sample of grains (perhaps ¼ inch in radius) on a microscope slide and view it through the eyepiece. When viewing sand through a microscope, it is best to use lighting that shines onto the sand from above rather than from below. If it is illumined from below, you will see the silhouettes of the grains, but miss the colors. Sometimes, depending on the composition of the sample, it might be better to use a black or white opaque card rather than a glass microscope slide, with lighting from above. The photographs accompanying this article were taken at I.S.O. 200 through a microscope at 100X magnification. They are all samples of mineral sands, except where noted. Each of the samples shown is unique and each shows the diversity found in a common, natural substance few ever think about—unless you’re a psammophile like me! Sand collecting is a fascinating hobby. For more information, visit the website of the International Sand Collectors Society, www.sandcollectors.org. I would appreciate receiving any sand samples readers might wish to send me. A small film canister or a baggie full, marked with the location at which the sample was collected, would be greatly appreciated. Please mail it to Rich Huck, 16243 Fullerton Meadows Dr., Wildwood, MO 63011.